This will be for beginners and pros alike. 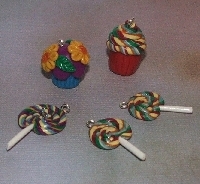 You will make 2 polymer clay charms for 1 partner. No smaller than 1/4 in without the jump ring or eye pin. You can use a push mold or freehand. This will be senders choice and if enough of us enjoy it and want more we'll do themes. I hope I have covered everything except a small give-away. Everyone that joins gets their name in a hat When partners are assigned I will draw a name and send 3 charms. LOL I'm too scared. I'm SO not artistic! There are a ton of sites out there with tutorials. I must warn you tho once you start with clay you just can't stop. LOL Yeah, like I need another addiction! No, you see, there are certain things I'm just completely retarded at. Paper crafts are #1 on my list. Making things with clay that look like someone older than 4 years old made them is something that is above my abilities LOL! Lets call that #2 on the "Cheryl's too retarded to accomplish this" list. Buck has pulled the name from the hat, actually my hand cause we don't have a hat.